It was a long time in coming but it seems like Newport Parks and Recreation has a huge winner on its hands. 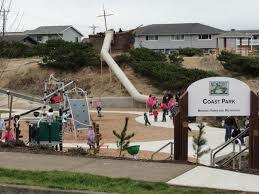 You can see that the new Coast Park, complete with a pirate ship on the hill, is really popular with families. Coast Park is located immediately south and east of the Performing Arts Center off West Olive Street. It has a full complement of durable playground equipment, both conventional and novel, as well as a long slide that starts at the pirate ship on the hill all the way down to a soft landing spot on the park’s main level. And of course there’s plenty of benches for the older folks to rest on, after they’ve worn themselves out just looking at all the youthful commotion. Website Design Copyright © 2018, L.E.T. Group, Inc. All Rights Reserved.